So which Star Wars books are canon these days? Very few, sadly. After Disney’s acquisition of the Star Wars franchise, the entirety of the Star Wars Exanded Universe (or EU) was scrapped, and although not wholly forgotten, it is now firmly considered non-canonical. A ‘canon’ is anything that is accepted as having actually happened or occurred in the collection or universe in question – and in the case of Star Wars that would mean any movie (including prequels) or television series already aired, as well as any books or comics approved by the Lucasfilm Story Group. The following is the official timeline of the current canon novels, including any books (except those considered junior or young adult). Descriptions of each novel are listed below. For those of us used to looking at the EU timeline, this looks frighteningly bare. But have no fear, more novels are in the works which should now sit comfortably in the canon. Note that ‘Battlefront’ appears on the list. This is most likely referring to the tie-in novel listed below. All novels listed below are categorized in the order they’ll be released, and not ordered according to the timeline above. Again, these do not include any junior novels (of which there are plenty), but will include some young adult novels. “Ever since the Jedi were marked for death and forced to flee Coruscant, Kanan Jarrus has devoted himself to staying alive rather than serving the Force. Wandering the galaxy alone, from one anonymous job to another, he avoids trouble–especially with the Empire–at all costs. So when he discovers a deadly conflict brewing between ruthless Imperial forces and desperate revolutionaries, he’s not about to get caught in the crossfire. Then the brutal death of a friend at the Empire’s hands forces the ex-Jedi to make a choice: bow down to fear, or stand up and fight. “Bestselling Star Wars veteran James Luceno gives Grand Moff Tarkin the Star Wars: Darth Plagueis treatment, bringing a legendary character from A New Hope to full, fascinating life. “When the Emperor and his notorious apprentice, Darth Vader, find themselves stranded in the middle of insurgent action on an inhospitable planet, they must rely on each other, the Force, and their own ruthlessness to prevail. “Based on unproduced scripts from the blockbuster TV show Star Wars: The Clone Wars! “Journey to The Force Awakens. Edit: According to the Star Wars Publishing Panel at SDCC 2015, this book is the first in a trilogy. “Star Wars meets Romeo and Juliet in this epic YA novel that follows two best friends who find themselves on opposite sides of the war between the Empire and the Rebellion. 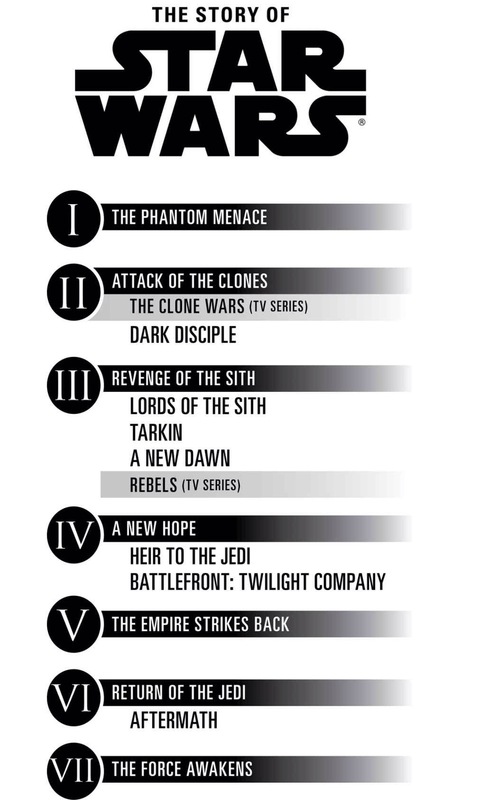 Edit: According to the Star Wars Publishing Panel at SDCC 2015, this takes place over a period that covers Episodes III-VI. It’s a shame that I haven’t read any of the books. It’s there in my list. I should read it soon. Great list. I’m a bit peeved that the Republic Commando books aren’t canon anymore, if The Clone Wars TV show is (though there is some contention over that too on Wookieepedia – but I think the recent events in SW Rebels confirm that they are). Once I read Lords of the Sith I will be caught up, and I’m really looking forward to Aftermath! I need to catch up on Rebels. Only watched the first few. I’ve only read Heir to the Jedi so far, but that was a really incredible story, definitely one to recommend there! Planning to start Lords of the Sith soon, though I’m still trekking through some of my now non-canon favourites first. Looking forward to your thoughts on LotS! Great work providing a clear timeline, and a release dates for the upcoming titles :). Thanks! Glad you appreciate it. So far, the only disappointing one has been Hearne’s, and even his it’s easy to see how it’ll get it’s fans. What I love about the canon so far is that in addition to filling out some back story, they’re plugging holes that the movies never quite explained [How can the Sith rule the Galactic Empire so openly? How can a relationship between Sith Master and Apprentice possibly function? ], and doing some intense exploration of the universe. Star Wars has always been very polarized morality wise – the Sith all look evil, have evil names, vice versa for the Jedi. Even that’s vanishing. Case in point – Dark Disciple may be the most important Star Wars novel written in the last decade, because it asks a very simple question; how far is too far for the Jedi to go? If they can prevent genocide by killing one person, do the means justify the end? Amazing stuff. I was on the fence where it comes to the reboot, as I’ve been reading Star Wars for a long time now, but there’s no argument that from what I’ve seen so far, they’re doing everything right that wasn’t being done in the now-Legends novels. That’s great to hear. I’ll have to follow along. Thanks for the comment. It’s getting me all the more excited as I check these out. Just started Lords of the Sith. Pretty great so far. Will check out your post! May I ask, Dark Disciple: is it necessary to have seen The Clone Wars cartoon prior to reading it? Nope. The book does a good enough job of letting you know who and why Ventress and Quinlan Voss are significant in terms of their personas and their appearances in the Clone Wars series. Some of those allusions will be lost on you, but not because you aren’t aware of what happened; you basically just won’t care. Thankfully, they’re not prevalent enough to interrupt the book’s flow, so you can read it with no worries. Great. 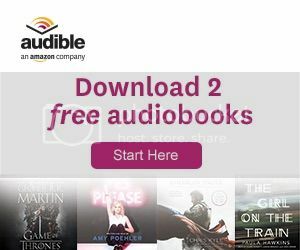 I know what I’ll be spending my audible credit on:) Thanks! Man, I want to copy you and try to read and review all of the new canon Star Wars novels before The Force Awakens comes out. I don’t know how well I’ll stick to it though. My to read and review pile is already pretty high! Little sad to hear that Heir to the Jedi was disappointing. I used to have a bit of a fangirl crush on Luke, lol. It’s easy because I’ve been reading them as they hit NetGalley, it’s when they pile up that it gets hard! If you’re a Luke fan then you might actually like it, Hearne does an excellent job of creating Luke as he was in Episode 4. What I couldn’t stand was the basic video-game style plot about the book. And then there was the budding contrived romance . . .